“Im just recovering from my injuries,” said Dr. Janet Garavaglia, known better to cable TV viewers as Dr. G. Medical Examiner. “I was trying to saw off the top of a dead man’s head,” said Dr. G. “That’s my favorite part of an autopsy, but no matter how hard I tried, I couldn’t get the saw to cut through the skull. By the time I realized that something was wrong the saw kicked back and nearly cut off my hand. 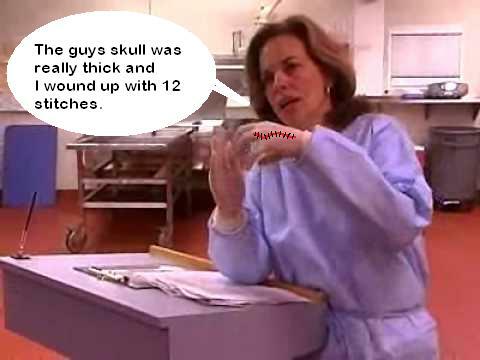 Florida State Medical investigators conducted an extensive investigation into the matter fearing that perhaps that there was a head-thickening virus spreading throughout the United States, but instead they found fingerprints around the morgue that belonged to actress Sally Field. Since there was no reason for Sally Field’s fingerprints to be in that morgue – which is never open to the public – investigators went to Miss Field’s home in Beverly Hills to probe deeper. Field is being held in the Beverly Hills lock-up but she will be released once a month so she can take her Boniva. SHE "HAS THIS ONE LIFE" BUT SHE MIGHT BE SPENDING IT BEHIND BARS. 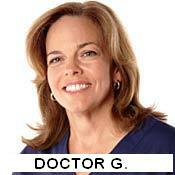 With all of the people in the world that Sally Field could hate, why did she pick on dr. Janet Garavaglio (Dr. G.)? Meanwhile, Dr. G is trying to put the pieces of her life together, and even though it will be months until she can use her hand again, she is hell bent on getting into that dead man’s head. Spokesmen for Boniva were not available for comment. PATRICIA NEAL DIES at 84 - Klaatu. Mirada. Nikto!